The Moses Lake businessman / Great Depression-era hobo / sheepherder / scrap metal tycoon / rail line owner / former Moses Lake city councilman / House of Poverty museum owner / mural subject died Wednesday, May 3, 2006, at 1:12 p.m.
Holm's daughter, Karen Rimple, said he passed away peacefully, and the family still wants to have a ceremony dedicating the mural which depicts Holm at various stages in his lifetime as planned at 11 a.m. on May 13. Rimple said Holm requested no services, memorial or flowers. He is survived by his wife of nearly 67 years, Ruth; his daughter Karen and her husband Wayne Rimple; two grandsons and their wives, Larry and wife Rika and Steven and wife Carmen; and five great-grandsons. Holm spent his youth in Clarkston, the son of a Lutheran minister. His mother died when he was about 6, and he went to live with an aunt for about nine months until her death. He left his home with his father and stepmother when he was 13. During his six years as a hobo during the Great Depression, Holm traveled all over the United States on trains, working off and on as a sheepherder in Montana during that time. Holm would later be sure to give everyone he met Werther's Original hard candies, gold hobo coins for luck, especially to every lady, and Symphony chocolate bars. At age 19, he walked into Everett with 10 cents -- 10 cents he kept -- and got started in the junk business. Holm came to Moses Lake from Everett in the 1950s, a move which resulted from a medical recommendation he leave the dampness of the area, which was impacting his lung problems. He founded Moses Lake Iron and Metal in the 1950s, which he sold to Norman Estoos in 1979, and Moses Lake Steel in the 1970s, which is managed today by Wayne and Karen Rimple. He also founded the House of Poverty Museum, where he would meet and greet all comers until very shortly before his death, always giving them Werther's Original candies, coins and/or chocolate Symphony bars. The museum showcased many antiques, including those he came across in his lifetime as well as in the scrap metal business, such as the sheepwagon he used while tending sheep in Montana, and a bell that had been on the U.S.S. Rasher, a highly decorated World War II Navy submarine, which had been considered lost by its crewmen. Holm returned the bell to the surviving members of the Rasher in 2005. Visitors to the museum could also tour Holm's train cars, which, according to his autobiography, were purchased to make good a promise he made to those who kicked him off their trains while he was a hobo that one day he would own his own railroad. Holm was one of the few remaining registered owners of a private rail line, and his collection includes a presidential dining car used by President Woodrow Wilson and later President Harry S Truman, the last steam engine operated in Alaska and several cabooses. Holm met many noted figures of history in his lifetime, some famous and some infamous. He watched Charles Lindbergh exhibiting his plane and later ate dinner with the pilot, who stayed the night at the Holm home in Rapelje, Mont., in the fall of 1922, five years before Lindbergh became famous for flying over the Atlantic Ocean. During his time as a hobo, he ate at a Chicago soup kitchen managed by Al Capone. -- I am past president of nothing -- but have the distinction of being the first Honorary Member of Theta Chi Fraternity since its origin in 1919, at Washington State University on Nov. 10, 1963. For an ex hobo and sheepherder, this is indeed an honor. Holm won the election in a landslide and served six years on the council. In 1999, Holm's autobiography, Once a Hobo ... The Autobiography of Monte Holm, was published. 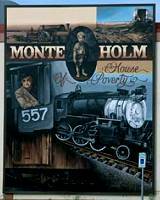 In 2005, muralist Patricia Jensen presented Holm with an oil painting version of her intended mural, which spurred a local movement to see the mural created and hung on the side of the Moses Lake Post Office. The mural was hung Tuesday. Several members of the Moses Lake community shared their thoughts and memories of Holm. I've been with Monte for a long, long time, and I thought he was a good boss and a great friend, said David Fazende, who helped Holm manage the museum and worked for him since 1969. Port of Moses Lake Commissioner Larry Peterson said he enjoyed stopping in and visiting Holm. 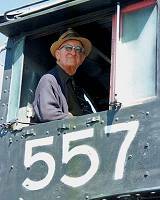 He recalled that Holm had wanted to drive his locomotive out to the airport and back during a celebration. The predominant railroad at the time was Milwaukee Railroad, and when Holm got ahold of them, the railroad told him no. Moses Lake Mayor Ron Covey said he has known Holm for almost 50 years. Dennis Clay worked with Holm for two and a half years to write his autobiography. One of the things Clay learned in writing the book was Holm's Sunday routine, listening to the song The Dying Hobo, on his old Victrola, which referred to an old hobo catching the westbound train, which means a hobo has died. Nick Tommer, current owner of Moses Lake Iron and Metal, also knew the train story. He said Norman Estoos called him and told him Holm had caught it. Norman Estoos purchased Moses Lake Iron and Metal from Holm in 1979. He started working for Holm in 1959 when he was still in high school. From his perspective as a son-in-law, Wayne Rimple said he couldn't have asked for a better father-in-law. On more than one occasion, Holm would share his three secrets to success -- being honest, working hard and being good to people. Most people fall down on item three something terrible, he would say. We're confident Monte Holm never did. Copyright � 2006, The Columbia Basin Herald. and helpful. When I read his book Once a Hobo ... The Autobiography of Monte Holm it had an impact on me that I will never forget.